Whether you’re woodworking or going skiing or scuba diving, nothing is more frustrating (and sometimes dangerous) than fogged goggles. Prevent the problem by coating the goggles with toothpaste and then wiping them off. Well-used baby bottles inevitable pick up a sour-milk smell. However, toothpaste will remove the odour in a jiffy. Just put some on your bottle brush and scrub away. Make sure you rinse off the toothpaste thoroughly. When your teenager moans about a prominent pimple, have him or her dab a bit of non-gel, non-whitening toothpaste on the offending spot, and it should be dried up by morning. The toothpaste dehydrates the pimple and absorbs the oil. This pimple-clearing remedy works best on spots that have come to a head. WARNING: This remedy may be irritating to sensitive skin. Try it on a small area of skin first. The mild abrasive in non-gel toothpaste is just the ticket for scrubbing the gunk off the bottom plate of your clothes iron. Apply the toothpaste to the cool iron, scrub with a cloth, then rinse clean. So the kiddies decided to express their artistic side all over the walls, huh? No worries. Rub a damp cloth and some toothpaste on your marked-up wall and rinse with a clean wet cloth. 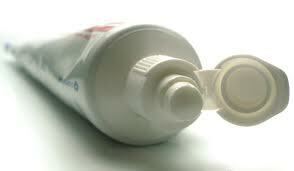 Don’t just use any old toothpaste, especially one containing artificial colors and fluoride. There seems to be more information coming out questioning the safety of fluoride in our toothpaste and water supply. I read about it years ago and been buying fluoride free toothpaste for my kids for the last 3 years. I figured that if there is some truth to it I was not going to take a chance. There is already fluoride in our water supply. I bring my kids to the dentist and neither one of them have had any decay or cavities from not having fluoride in their toothpaste. There are some good fluoride free toothpastes out there. I have to admit it did take testing out several different toothpastes to get the right flavor that they liked. They do prefer Burt’s Bees brand. When I mentioned to some friends that I only buy fluoride free toothpaste for my kids they looked at me like I was crazy. A couple of them have switched to fluoride free after they read up on it. Here is a couple of websites you can go to to research it for yourself. It’s your call.